There is a way for you to edit MP4 video in HD even with a slow and old laptop. This trick was given to me by a friend who's a professional filmmaker and it applies to all kinds of videos. However, there seems to be a high interest in GoPro editing and in this tutorial I'll refer to GoPro HD footage which comes in H.264 MP4 encoding. This experiment and all my video editing, including GoPro clips, are done with Magix Edit Pro. I like it for its simplicity and ease of use. Now, if your default video editing software cannot handle this kind of videos, then you can convert MP4 to AVI with MPEG Streamclip (a free piece of software). The thing to remember from the start is to use the same video format and the same aspect ratio throughout this process. So if you convert your files to a lower resolution - either with MPEG Streamclip or with Leawo MP4 converter - make sure the extension (.avi, .mp4, .mov) will be the same in all steps of the editing work. Example: Original MP4 file in 1280/720 pixels at 30 fps will be converted to MP4 clip in 680/384 pixels at 30 fps. The 16:9 aspect ratio is maintained. Set a new folder destination for the new files as to keep the same file name for each video (same file name as the full resolution file). This is important! Now that your video files are lighter and have a smaller file size, it'll be much easier for your computer to handle them. Drag all the other media files you want to use in the same folder (music, sound effects, pictures). This requires less memory and processing power when the computer compiles your edit. Less paths to remember since everything is in one place. Now you can edit your video. Make the cuts, add the music, the titles and transitions. When you're done editing, save the file and close it. Yes, that's right. Delete all the converted clips (light files in low resolution) and replace them with their HD version. We're still using the same destination folder, right? The name of the files must be the same. So if the name of a certain low resolution file was GOPR1808.mp4, then the high resolution clip should have the same name - GOPR1808.mp4. As you open the project file, it will pull all the videos, this time in full resolution. The original HD files are in place. The editing is done. All you have to do now is to make sure the aspect ratio and resolution are correct before exporting your final edit - change these settings both for the project file and the export parameters. Hit the export button and go on vacation for a week. :-) This is what my friend actually told me. And it's understandable. A slow computer with little video memory (or no dedicated graphics card at all), little RAM and little processing power can take more than an hour to compile a 5 minute edit, especially if you made many cuts and color corrected the scenes. Close all other applications and programs, including the WiFi (switch). You want to dedicate all hardware resources to your extreme sports video edit. Make sure there's no blanket of dust stuck in the air vent of your laptop. Search on Google or on YouTube the name and model of your machine along with the words remove dust. Dust and poor ventilation causes overheating which leads to poor performance and forced automatic shut down. Use a laptop cooler. The performance of my laptop improved significantly after I removed the dust and started using a cooler. I use a Canyon. 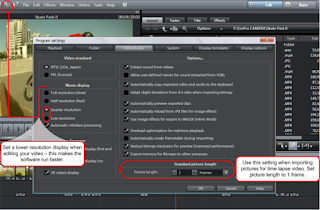 Magix Edit Pro allows you to set a lower resolution display when working on your video. This makes the program run faster (faster preview and playback). 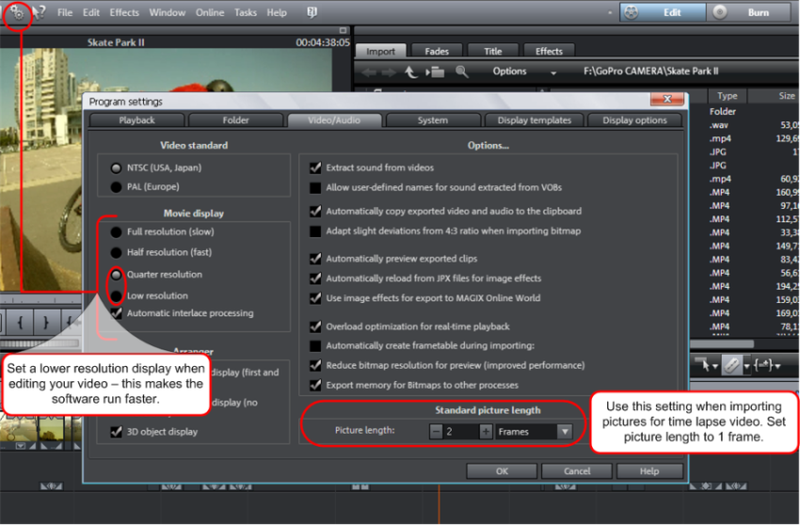 Look for a similar option in your current video editing software. Having to do all sorts of tricks to get the job done can be frustrating. But until you get a new, more powerful computer, you can actually edit your GoPro HD videos by following a few simple steps as I've described above. but I have an old, slow laptop with which to use your teachings. Sony Vegas is a powerful video editor. Lots of professional use it - so congrats for that! No problem, Omri. Always happy to help. Cheers!